In Japan, Fukurokuju (福禄寿) (from Japanese fuku, "happiness"; roku, "wealth"; and ju, "longevity") is one of the Seven Lucky Gods in Japanese mythology. It has been theorized that he is a Japanese assimilation of the Chinese Three Star Gods (Fulushou) embodied in one deity. Most related in appearance to the Chinese star god Shou, he is the God of wisdom and longevity. According to some, before attaining divinity, he was a Chinese hermit of the Song Dynasty and a reincarnation of the Taoist god Xuanwu. It is said that during his human incarnation, he was a sennin; a philosopher who could exist without eating food. Fukurokuju probably originated from an old Chinese tale about a mythical Chinese Taoist hermit sage renowned for performing miracles in the Northern Song period (960–1127). In China, this hermit (also known as Jurōjin) was thought to embody the celestial powers of the south polar star. Fukurokuju was not always included in the earliest representations of the Seven in Japan. 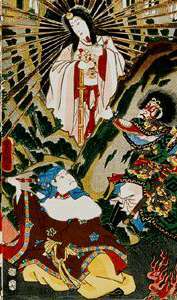 He was instead replaced by Kichijōten (goddess of fortune, beauty, and merit). He is now, however, an established member of the Seven Lucky Gods. 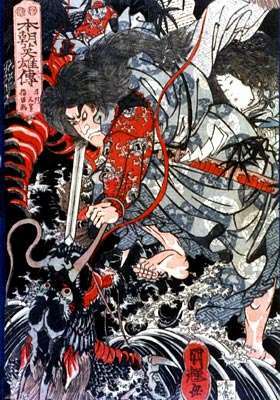 He is sometimes confused with Jurōjin, another of the Several Gods of Fortune, who by some accounts is Fukurokuju's grandson and by other accounts inhabits the same body as Fukurokuju. As such, the two are often confused. Usually portrayed as bald with long whiskers, he is said to be an incarnation of the Southern Polestar. In many depictions, Fukurokuju has an abnormally high forehead. The sacred book tied to his staff either contains the lifespan of every person on earth or a magical scripture. 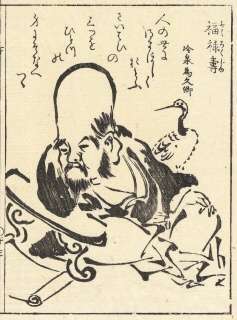 He is accompanied by a crane and a turtle, which are considered to be symbols of longevity. He is also sometimes accompanied by a black deer (ancient legends say a deer turns black if it is over 2000 years old). He is the only member of the Seven Lucky Gods credited with the ability to revive the dead. ↑ Graham, Patricia (2007). Faith and Power in Japanese Buddhist Art, 1600-2005. University of Hawaii Press. p. 110. ISBN 978-0-8248-3126-4. ↑ "寿老人" [Jurōjin]. Nihon Daihyakka Zensho (Nipponika) (in Japanese). Tokyo: Shogakukan. 2013. OCLC 153301537. Retrieved 2013-01-12. Ashkenazi, Michael. 2003. Handbook of Japanese Mythology. ABC-CLIO.